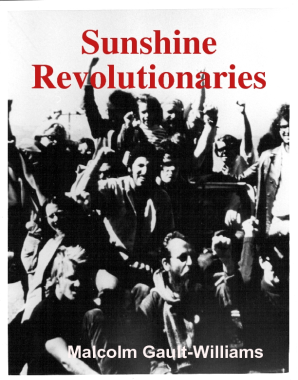 First self-published in 1987 under the title "Don't Bank on Amerika," this comprehensive history of the Isla Vista riots of 1970 was later titled "Sunshine Revolutionaries" (1996-2002). I changed the title back again in 2004 to "Don't Bank on Amerika," but I found many people confused between my history of the riots and the film that was done during those times, with the same name. 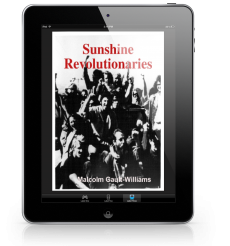 So, for this fourth edition (2017), I've reverted back to "Sunshine Revolutionaries," the name under which it is copyrighted. At 224 pages, it remains the best and most detailed single resource available on the riots. The first edition of my history of the Isla Vista riots ("Sunshine Revolutionaries") came out as a self-published spiral-bound photocopy in 1987 with a print run of less that 50 copies. One is still archived in Special Collections at the UCSB Library. Additionally, I shared a digital copy with friends and those most interested. The second edition ("Don't Bank on Amerika") was also self-published, but this time as a true paperback, in 2002, with no digital copy. This hardcopy was moderately popular for the ten years of its publication, selling over 100 copies. It became a real resource to those who wanted to know the details of the riots. Unfortunately, both the first and second editions are no longer available. I enjoyed reading your zesty and commendably comprehensive “Unofficial History of Isla Vista” in the recent issue of Coastlines. Overall, I found it very informative. While it’s true that I have played a “controversial” role in Isla Vista over the years, the question is controversial to whom? The vested interests (the County, the University and absentee landlords) for sure. And that quarrelsome clique of a dozen homeowners from I.V.’s West End that hate everything about UCSB, including its students. However, in town I was always considered a “moderate”. What I found most problematic in your account is it gives me far too much credit for carrying too much of the major issues facing the town. I’m a big boy; I can take it. But it’s embarrassing among my peers, because you portray a significant social movement as a personality cult. The perspective in your article seriously understates the contribution of literally hundreds of people that played major roles in Isla Vista’s community-building period following 1970. Many of these people today play leadership roles in government and business, both locally and across America, and who credit their hands-on experience in Isla Vista as the foundation for understanding how society could work better. Most of these overlooked builders attended UCSB and many are likely subscribers to Coastlines. In fact one of your readers wrote: I never knew you that well but his description did not fit you. And thanks Carmen for sticking up for us all. We DID try to create the kind of culture we wanted to live in and even if we failed, we all grew as a result and the effects are still with us. Over a hundred of these folks have been attending Isla Vista “reunions” in recent years, something that is certainly unique. How many towns have reunions? It’s puzzling that these reunions have yet to be noticed by Coastlines, since the event last July had its banquet in the Mosher Alumni Center. 1. The chapter featuring “a photograph of the former Santa Barbara County Sheriff’s Captain Joel Honey wearing a medieval sword and mace on his uniform during the Isla Vista riots,” was written by UCSB grad Malcolm Gault-Williams. 2. You state that “Lodise argues that . . . under pressure from locals, the Regents backed off [a plan] to incorporate Isla Vista into the main campus and build its student housing there . . . and allowed Isla Vista to develop with little urban infrastructure, planning or oversight.” In fact, the chapter in the book on the shenanigans of the University and County in the creation of Isla Vista has only minor changes from essays written by two other UCSB grads, IVCC rep. JoAnne Yokota and Associated Students president Abby Haight, not I. Their documentation of that era is compelling enough that even you wrote it up nearly as they told it. In fact, well over half the book is composed of writings, speeches, and interviews of other major players in the town’s rich history. Because I have conveyed the message, it’s often disregarded that I was reflecting the opinions of a lot of people during my 30 years of activism in Isla Vista. For example, I was elected to the IVCC in 1972 along with Bill Wallace and Dr. Dave Bearman. There was an advisory measure on the same ballot on the subject of local government options for Isla Vista. Over 80% of the 4,000-plus voters supported an independent City of Isla Vista, so I worked towards that. Eight more such elections over 15 years also supported it; I advocated on behalf of those results. 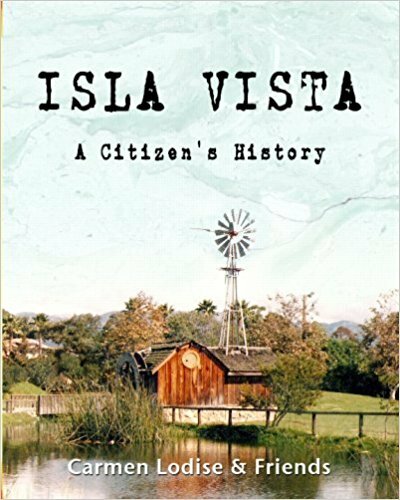 I didn’t invent Isla Vista Cityhood, which is what your “unofficial history” implied. I appreciate your comment that: “Almost 45 years later [the 1970 Trow Report’s] recommendations seem as current today as then.” Readers of your article may be surprised to find that this is also the stated conclusion of the 20-plus pages in my book dedicated to the Report’s text and analysis. You perhaps aren’t aware that the IVCC asked the UC Regents to review the findings of the Trow Report in 1984. However, Chancellor Robert Huttenback vehemently dismissed the request as a “red herring” and prevented even a vote on undertaking such an evaluation. Your article quotes Ed Birch saying recently that the lack of government structure is “the” problem in Isla Vista, an observation I find particularly galling. As Huttenback’s hatchet man in the community, vp Birch was in charge of the Administration’s campaign opposing I.V. cityhood in the 1980s. First they claimed it wasn’t financial infeasible, then several months later hired a consultant to “document” that assertion. This was quickly followed by Birch’s ending of University funding to the IVCC in retribution for its continued pursuit of cityhood after their declared disapproval. However, the County’s EIR, which was completed under state guidelines by two UCSB professors, concluded that the proposed city was financially feasible if each resident would be willing to pay $18-per-year to have policy control over police, planning, transportation, etc. When these study results were announced, a front page story in the Daily Nexus quoted Administration officials saying that students couldn’t afford what it would cost to run such a city. At literally the same time, the Administration was promoting a referendum in which students were being asked to assess themselves $54-per-quarter to pay for an addition to the Ucen. While it was IVCC rep. Mike Boyd, not I, who popularized the moniker of “Fast Eddie” for Birch, it was definitely well deserved. I was properly impressed with UCSB planner Chuck Haines vision of a more physically integrated campus and town presented in your interview with him. But as to Birch’s recommendation that “the University should partner with local investors to upgrade the housing stock . . .”, good luck. The partnership between the County and local investors through the RDA resulted in several new multi-storied apartment buildings. The Icon structure, which you properly called “ostentatious”, has 105 beds but only 17 parking places. This is hardly progress. Finally, I found your summary statement that my activism was “often to no avail” was a bit over-the-top. Today, there are a lot of parks in a town that had only one when I arrived and I was on the park board when the first million-dollar-package was purchased. In addition, I was in the leadership of saving Perfect Park from a County-approved development and the later campaign to establish a monument there to the worldwide anti-war movement of the 1970s. Also, the issues of my weekly newspaper, the Isla Vista Free Press (1987-89), were considered important enough to have been digitalized and made available at UCSB Special Collections (http://www.library.ucsb.edu/special-collections/research/ivweb/ivFP). And then, there’s that book . . .
1. “The University . . . did support Isla Vista being annexed to Goleta when that city incorporated.” I believe that the U failed to state an opinion. 2. I don’t believe the census information you provided is about the half-square mile everyone knows as Isla Vista, which is still 95%-plus renters the last time I looked vs. the 83% you reported. Your data appears to be that of the “Isla Vista CDP”, a 1.86 sq.-mile area that includes many owner-occupied residential units along Storke Road. 3. The decision whether the RDA-owned Clinic building is to be sold hasn’t been made yet – it’s due any day now from the state Dept. of Finance. Your article didn’t mention that the community is also seeking the vacant RDA-owned building next to it as a meeting hall. Together, these buildings would become the community center that the RDA proposed to build out on Estero Road, which also is not mentioned in your list of approved RDA projects scuttled by the state’s financial crisis. This community center outcome is being supported by Supervisor Doreen Farr, Assemblymember Das Williams and State Senator Hannah-Beth Jackson. So, it’s a substantial issue pertaining to the community, one in which I’m involved. It’s interesting to note that Chancellor Yang signed a “treaty” to end the 1994 hunger strike by minority students that committed the U to do everything possible to help establish a community center in Isla Vista. Yet, the U hasn’t been heard from in this five-month old campaign to save the two RDA-owned buildings. In case you’re interested, I’ve been told a copy of that signed document is available in Special Collections. This failure to act doesn’t bode well for the “Promises to Pay” commitments you outline as UCSB expands enrollment to 25,000 over the next 20 years. All in all, however, I believe your article fairly affirms the community’s shortcomings, although not its assets, and the foundation of the challenges it still faces – after all these years. While I admit to being quick-tempered in some instances, I don’t believe I’m petulant. But I admit to admiring your vocabulary skills. Random thoughts---Thank you for sharing this, Carmen, and for your reply! I don't even know where to begin in commenting on UCSB's dismal history with Isla Vista. The only good thing I can come up with easily is the foot patrol, which put campus cops onto community-based teams with sheriffs. I still use that as an example of authentic community-based policing when advocating for the cops to get out of their cars in the city I live in. IV taught me about the effects of capitalism on the housing market, and instilled in me a life-long commitment to renters' rights. LOVE your reference to our community reunions! They should be noted in national publications! I recently told the Isla Vista story to a couple of fairly young union organizers as a way of explaining who I am today. One of them borrowed your book from me! We were always more stoned than drunk, though I do remember going down to the ABC office with Eileen Yamashita to ask them to give us liquor licenses in IV. Also the pot is so much stronger now. I think the current party culture has more to do with the frat culture vs. the hippie culture. You remember that one of the frat houses was leased to Das Institut during my time in IV. The current party culture is way over the top. My older son lived in IV one year (maybe 3 years ago) and it was even too much of a party scene for him. (and that is saying something!) I don't think that density is the problem so much as the culture. I put a lot of blame on the starvation of California education. They don't provide enough services or small enough classes to keep students engaged and in relationship with older people. It is really easy for the students to get lost in the crowd, especially if they have mental health issues, substance abuse problems, etc. I got a kick out of the reference to "in loco parentis". I think that change came about when I was a student, and we were very happy about it! There is no question that Isla Vista should have formed a city, and that the University's opposition is what blocked it. My life was fundamentally shaped by my Isla Vista experience. Every day I practice something that I learned there, including local government powers and organization, canvassing (we called it "community communication"), persuasive analysis and writing, community organizing, and advocacy with public entities. Truly, this is what I do every day, and I learned it in IV! Thank you Carmen, I enjoyed the read. I never knew you that well but his description did not fit you. And thanks Carmen for sticking up for us all. We DID try to create the kind of culture we wanted to live in and even if we failed, we all grew as a result and the effects are still with us. I am trying to understand what Thurlow means by a "Lodisean" history. I guess you were pretty good at arch-criticism, so that if the emperor had any clothes at all, you could strip 'em bare, give 'em a fig leaf and a new descriptive nickname. If I were to do the same to you I would frame your style to be fitting as a graduate student of Machiavelli. But I never thought you to be amoral, but always to have a large part of your agenda in the realm of the public good. The best and greatest reunion of IV activists took place in the summer of 2013.
a.k.a "Don't Bank on Amerika"